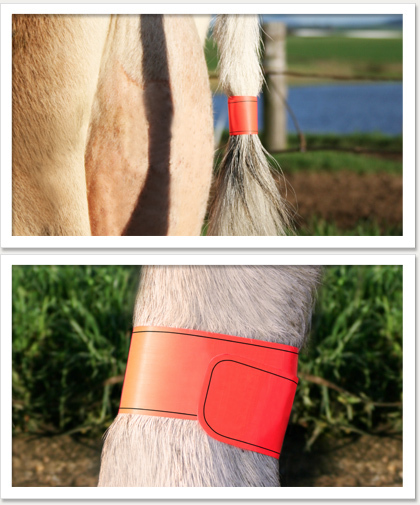 A simple way to identify & manage your cows with BOViTAG™. By writing with a permanent marker on the tag, you can quickly identify the reason why the cow was tagged. BOViTAG™ is self-adhesive and is available in various colours. Choose application area towards the lower end of the tail. 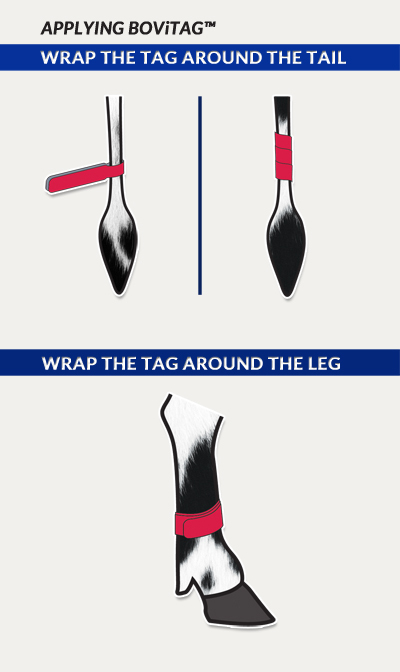 Fold the tag around the tail, so that the two edges of the tag joins again. Alternatively you can wrap it around the tail. Trim the tag if desired. Do not fit it too tightly around the tail, since it might affect circulation. Wrap the BOViTAG™ around the lower end of the leg. Do not fit it too tightly, since it might affect circulation. Cut the tag with a pair of scissors or knife. Click here for a printable BOViTAG™ manual. This product is guaranteed free of defects in material and workmanship for two years from the date of manufacture. Suitability of the product for the Buyer’s intended purposes is the responsibility of the Buyer. Liability is limited to the replacement or replacement value of the product.